jasonor see what happened after bro H and bones recommend this stock? it drops... now maybe they are planning to do dead cat bounce to trap more ppl in b4 disposing again. cheeyong Big is coming back.. any news? davidkkw79 It's QR losses 4 sen again. davidkkw79 Wah...losses result still can up oh ! MyInvest Looks good show today.... Cheers. Ivan09 Any special news bring in the movement? genius appolloang can you explain more ? What do you mean by "no buy will up"
BILLC Nobody buys then operators need to keep pushing up the price to attract new sochai mah!! genius This counter is a hell yo. Don't ever come here. Why I said so? Because the price and queue only played by the operator n someone. The q sell the q buy. They cancel sell buy they push higher price. They sold when high. Trap retailers. Trust me. LouiseS This company has been making losses in last 10 quarters, just this quarter return back to profit. The positive result (still small though) recorded in 1Q19 was mainly from the better performance of its gas division which saw a higher demand for its maintenance service for the O&G industries. Management believes that this trend will continue and is hopeful that division will be able to post profit for FY19. Concrete division on the other hand is still recording losses but at a smaller amount. For the company to achieve a PAT of RM1mil for this FY would already be a very good achievement. The group balance sheet is not that bad with net gearing of only 13%. The company’s main issue is still on its ability to deliver profit to its shareholders. The company had only managed to deliver 1 full year profit to its shareholders (in FY13) for the past 10 years. 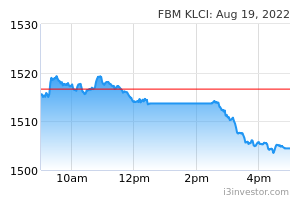 It would actually make more sense for the company to close its business and liquidated its assets which currently has an NTA of RM0.65 per share (more than double its current share price). If you are looking to diversify your portfolio outside of Big Industries (due to earnings uncertainties), I would recommend you to look at MBMR. MBMR is a direct proxy to Perodua via its 22.6% interest in the company. Valuation is cheap at only 6.2x PE (based on target FY18 PATAMI of RM145mil. 9m PATAMI is already RM106mil). PB is low at only 0.5x BV. 4Q18 results is expected to be higher than 3Q18 and last year's 4Q17. targetinvest Oil and gas picking up ma..
HoselGoh BIG also related to oil n gas..
Newinvest_112 Downtrend..should buy or sell? ramada Why you sudden close your comment box? The higher profit was mainly contributed by the gain on disposal of vacant land which worth RM3.1 million. That's all. ramada Next time you should tell people the whole story, not try to hide the negative news under your pillow. NoEmo The co has lots of valuable land bank in strategical areas of east Malaysia. The oni concern is the on-going legal suit arising from 2013 Bintulu land sales that may incur rm0.7m compensation. But the land value should hv hugely appreciated right now, a blessing in disguise. NoEmo Pat rm2m in first 2 qtrs of fy2019. 75% of it from gas business and 25% from property/land disposal. NoEmo Big will be a beneficiary of rising oil price as a gas suppliers to upstream o&g companies. NoEmo Its share capital base is extremely small, oni 48m. Potential stock to initiate share split exercise. NoEmo 27ksm of land bank in kota kinabalu is earmarked for property development, pending approval by relevant authority.